- The Regent is formally acknowledged as King Charles IX of Sweden after John, Duke of Östergötland renounced his claim to the throne, and all non-Lutherans are banned from inheriting the throne. - The city of Göteborg is founded. 25 September - Polish victory in the Battle of Weissenstein. 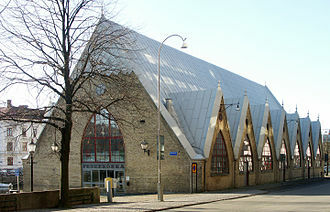 ^ Isacson, Claes-Göran (ed) (2006). Vägen till Stormakt (in Swedish). Stockholm: Norstedts. ISBN 91-1-301502-8. This year in Sweden article is a stub. You can help Wikipedia by expanding it. The history of the Netherlands is the history of seafaring people thriving on a lowland river delta on the North Sea in northwestern Europe. Records begin with the four centuries during which the region formed a border zone of the Roman empire. This came under increasing pressure from Germanic peoples moving westwards, during the Middle Ages, the descendants of the Carolingian dynasty came to dominate the area and extended their rule to a large part of Western Europe. 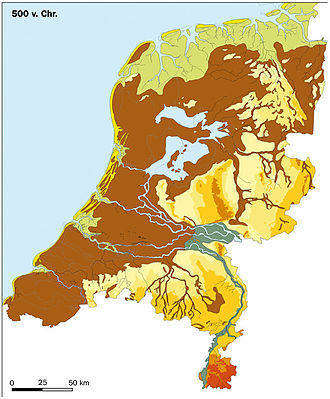 The region of the Netherlands therefore became part of Lower Lotharingia within the Frankish Holy Roman Empire, for several centuries, lordships such as Brabant, Zeeland, Friesland and others held a changing patchwork of territories. There was no unified equivalent of the modern Netherlands, the Catholic kings of Spain took strong measures against Protestantism, which polarized the peoples of present-day Belgium and Holland. In the Dutch Golden Age, which had its zenith around 1667, there was a flowering of trade, the arts and the sciences. A rich worldwide Dutch empire developed and the Dutch East India Company became one of the earliest and most important of national companies based on entrepreneurship. During the 18th century the power and wealth of the Netherlands declined, a series of wars with the more powerful British and French neighbors weakened it. Britain seized the North American colony of New Amsterdam, turning it into New York, there was growing unrest and conflict between the Orangists and the Patriots. 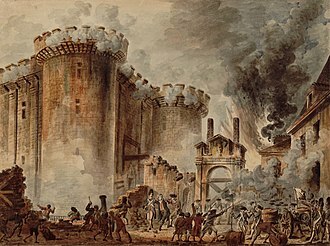 The French Revolution spilled over after 1789, and a pro-French Batavian Republic was established in 1795–1806, Napoleon made it a satellite state, the Kingdom of Holland, and simply a French imperial province. After the collapse of Napoleon in 1813–15, an expanded United Kingdom of the Netherlands was created with the House of Orange as monarchs, ruling Belgium, the King imposed unpopular Protestant reforms on Belgium, which revolted in 1830 and became independent in 1839. After an initially conservative period, in the 1848 constitution the country became a democracy with a constitutional monarch. Prussia was a historic state originating out of the Duchy of Prussia and the Margraviate of Brandenburg, and centred on the region of Prussia. For centuries, the House of Hohenzollern ruled Prussia, successfully expanding its size by way of an unusually well-organised, with its capital in Königsberg and from 1701 in Berlin, shaped the history of Germany. In 1871, German states united to create the German Empire under Prussian leadership, in November 1918, the monarchies were abolished and the nobility lost its political power during the German Revolution of 1918–19. The Kingdom of Prussia was thus abolished in favour of a republic—the Free State of Prussia, from 1933, Prussia lost its independence as a result of the Prussian coup, when the Nazi regime was successfully establishing its Gleichschaltung laws in pursuit of a unitary state. Prussia existed de jure until its liquidation by the Allied Control Council Enactment No.46 of 25 February 1947. The name Prussia derives from the Old Prussians, in the 13th century, the Teutonic Knights—an organized Catholic medieval military order of German crusaders—conquered the lands inhabited by them. In 1308, the Teutonic Knights conquered the region of Pomerelia with Gdańsk and their monastic state was mostly Germanised through immigration from central and western Germany and in the south, it was Polonised by settlers from Masovia. The Second Peace of Thorn split Prussia into the western Royal Prussia, a province of Poland, and the part, from 1525 called the Duchy of Prussia. The union of Brandenburg and the Duchy of Prussia in 1618 led to the proclamation of the Kingdom of Prussia in 1701, Prussia entered the ranks of the great powers shortly after becoming a kingdom, and exercised most influence in the 18th and 19th centuries. During the 18th century it had a say in many international affairs under the reign of Frederick the Great. During the 19th century, Chancellor Otto von Bismarck united the German principalities into a Lesser Germany which excluded the Austrian Empire. At the Congress of Vienna, which redrew the map of Europe following Napoleons defeat, Prussia acquired a section of north western Germany. The first documented use of a name resembling Navarra, Nafarroa, or Naparroa is a reference to navarros, in Eginhards early 9th Century chronicle of the feats of the Holy Roman Emperor Charlemagne. Other Royal Frankish Annals feature nabarros, there are two proposed etymologies for the name. Basque nabar, multicolor (i. e. in contrast to the mountainous lands north of the original County of Navarre. Basque naba, plain + Basque herri, the linguist Joan Coromines considers naba to be linguistically part of a wider Vasconic or Aquitanian language substrate, rather than Basque per se. During the Roman Empire, the Vascones, a tribe who populated the southern slopes of the Pyrenees. 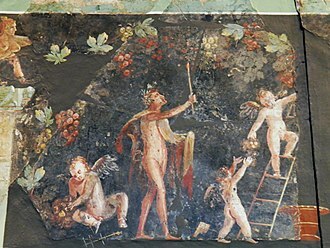 In the mountainous north, the Vascones escaped large-scale Roman settlement, not so the flatter areas to the south, which were amenable to large-scale Roman farming—vineyards and wheat crops. Neither the Visigoths nor the Franks ever completely subjugated the area, the Vascones included neighbouring tribes as of the 7th century. In AD778, the Basques defeated a Frankish army at the Battle of Roncevaux Pass and that kingdom reached its zenith during the reign of King Sancho III, comprising most of the Christian realms to the south of the Pyrenees, and even a short overlordship of Gascony. When Sancho III died in 1035, the Kingdom of Navarre was divided between his sons and it never fully recovered its political power, while its commercial importance increased as traders and pilgrims poured into the kingdom throughout the Way of Saint James. 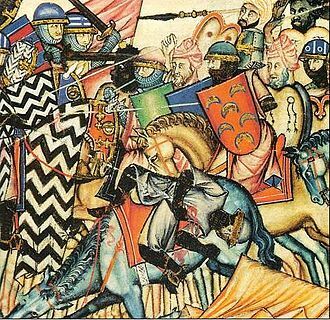 In 1200, Navarre lost the key western Basque districts to Alphonse VIII of Castile, Navarre contributed with a small but symbolic force of 200 knights to the decisive Battle of Las Navas de Tolosa in 1212 against the Almohads. The native line of kings came to an end in 1234, the Navarrese kept most of their strong laws and institutions. To the south of the Pyrenees, Navarre was annexed to the Crown of Castile, but keeping a separate status. A Chartered Government was established, and the managed to keep home rule. The history of Spain dates back to the Early Middle Ages. In 1516, Habsburg Spain unified a number of disparate predecessor kingdoms, its form of a constitutional monarchy was introduced in 1813. After the completion of the Reconquista, the kingdoms of Spain were united under Habsburg rule in 1516, during this period, Spain was involved in all major European wars, including the Italian Wars, the Eighty Years War, the Thirty Years War, and the Franco-Spanish War. The former Spanish Empire overseas quickly disintegrated with the Latin American wars of independence, the war ended in a nationalist dictatorship, led by Francisco Franco, which controlled the Spanish government until 1975. The post-war decades were relatively stable, and the country experienced economic growth in the 1960s. 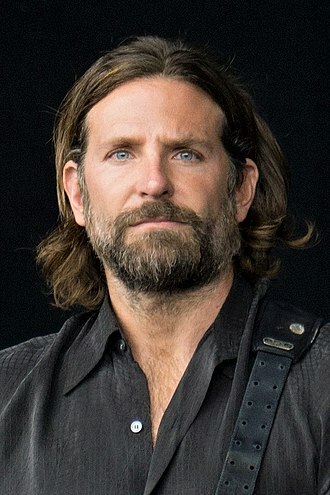 Only with the death of Franco in 1975 did Spain return to Bourbon constitutional monarchy headed by Prince Juan Carlos, Spain entered the European Economic Community in 1986, and the Eurozone in 1999. The financial crisis of 2007–08 ended a decade of economic boom and Spain entered a recession and debt crisis and remains plagued by high unemployment. Spain is ranked as a middle power able to exert regional influence but unlike other powers with similar status it is not part of the G8, the Iberian Peninsula was first inhabited by anatomically modern humans about 32,000 years BP. Modern humans in the form of Cro-Magnons began arriving in the Iberian Peninsula from north of the Pyrenees some 35,000 years ago, the seafaring Phoenicians and Greeks successively established trading settlements along the eastern and southern coast. The first Greek colonies, such as Emporion, were founded along the northeast coast in the 9th century BC, the Greeks are responsible for the name Iberia, apparently after the river Iber. In the 6th century BC, the Carthaginians arrived in Iberia, struggling first with the Greeks and their most important colony was Carthago Nova. 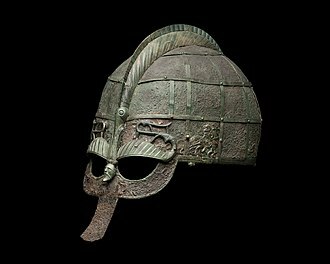 The Celts mostly inhabited the inner and north-west part of the peninsula, in the inner part of the peninsula, where both groups were in contact, a mixed culture arose, the Celtiberians. The Celtiberian Wars were fought between the legions of the Roman Republic and the Celtiberian tribes of Hispania Citerior from 181 to 133 BC. Events from the year 1632 in Sweden Foundation of the Rudbeckii flickskola, the first school for girls. March – Thirty Years War – Gustavus Adolphus of Sweden invades Bavaria with his army, april 15 – Thirty Years War – Gustavus Adolphus defeats Tilly for the second time within a year at the Battle of Rain. Tilly is severely wounded during the battle, may – Thirty Years War – Munich, capital of Bavaria, is captured by the Swedish army. 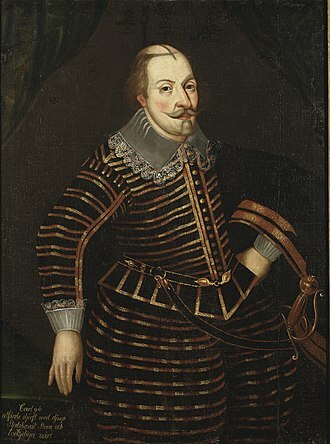 September 9 – Thirty Years War – Besieged by Wallenstein at Nuremberg, Swedish king Gustavus Adolphus attempts to break the siege, october 15 – Official opening of the University of Tartu in Swedish Livonia. November 16 – Thirty Years War – Battle of Lützen – Swedish king Gustavus II Adolphus leads an assault on Wallensteins army, despite the kings death, the Swedish commanders manage to rally the army and eventually defeat Wallensteins army. As a result, Wallenstein withdraws from Saxony, catharina Stopia is appointed to succeed her deceased spouse as Swedens ambassador to Russia, and thereby becomes the first female diplomat of her country. Events from the 1600s in England. Monarch – Elizabeth I, James I.1600 January – in Ireland, Hugh ONeill, 2nd Earl of Tyrone,11 February–March – clown William Kempe morris dances from London to Norwich. April – publication of Ben Jonsons play Every Man out of His Humour,31 December – East India Company granted a Royal Charter. 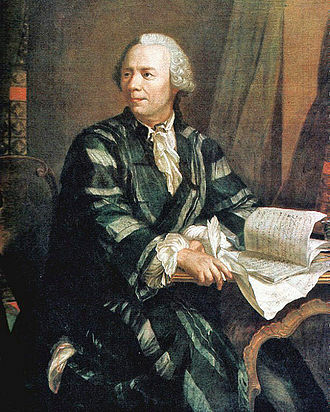 First publication of William Shakespeares play The Merchant of Venice and A Midsummer Nights Dream, William Gilbert publishes De Magnete, discussing Earths magnetic field, one of the first important scientific works to be published in England. 1601 7–8 January – Robert Devereux, 2nd Earl of Essex, spring – possible first performance of Shakespeares tragedy Hamlet. 2 October–3 January 1602 – the Siege of Kinsale ends the Nine Years War, November – Elizabeth I addresses her final parliament with the Golden Speech. An Act for the Relief of the Poor codifies the English Poor Laws,16022 February – first recorded performance of Shakespeares comedy Twelfth Night, in Middle Temple Hall, London. 8 November – the Bodleian Library at the University of Oxford is opened, publication of Shakespeares comedy The Merry Wives of Windsor. Richard Carew publishes The Survey of Cornwall, April – Thomas Cartwright delivers his Millenary Petition, demanding an end to ritualistic practices, and signed by 1,000 Puritan ministers, to the King. 28 April – funeral of Elizabeth I in Westminster Abbey,17 July – Sir Walter Ralegh arrested for treason. 21 July – Thomas Howard created the 1st Earl of Suffolk,25 July – coronation of James I as King of England in Westminster Abbey. 17 November – Ralegh goes on trial for treason in the converted Great Hall of Winchester Castle and he is found guilty but his life is spared by the King at this time and he is returned to imprisonment in the Tower of London. 160414 January to 16 January – Hampton Court Conference with James I, work begins on the Authorized King James Version of the Bible and revision of the Book of Common Prayer. 19 March – Parliament assembles and debates Robert Cecils proposal for union with Scotland,18 August – the Treaty of London brings an end to the Anglo–Spanish War, an intermittent conflict which has been going on since 1585. 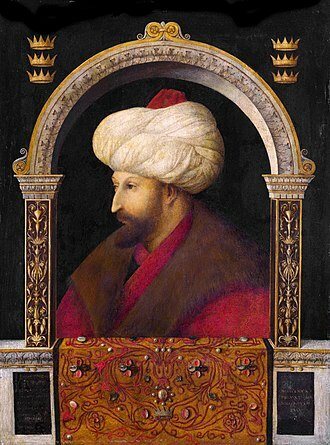 The Ottoman Empire was founded by Osman I. As sultan Mehmed II conquered Constantinople in 1453, the state grew into a mighty empire, the empire came to an end in the aftermath of its defeat by the ] in World War I. The empire was dismantled by the Allies after the war ended in 1918, with the demise of the Seljuk Sultanate of Rum, Anatolia was divided into a patchwork of independent states, the so-called Anatolian Beyliks. By 1300, a weakened Byzantine Empire had lost most of its Anatolian provinces to these Turkish principalities, one of the beyliks was led by Osman I, from which the name Ottoman is derived, son of Ertuğrul, around Eskişehir in western Anatolia. In the foundation myth expressed in the known as Osmans Dream. According to his dream the tree, which was Osmans Empire, issued four rivers from its roots, the Tigris, the Euphrates, the Nile, the tree shaded four mountain ranges, the Caucasus, the Taurus, the Atlas and the Balkan ranges. During his reign as Sultan, Osman I extended the frontiers of Turkish settlement toward the edge of the Byzantine Empire, in this period, a formal Ottoman government was created whose institutions would change drastically over the life of the empire. In the century after the death of Osman I, Ottoman rule began to extend over the Eastern Mediterranean, Osmans son, captured the city of Bursa in 1326 and made it the new capital of the Ottoman state. The fall of Bursa meant the loss of Byzantine control over Northwestern Anatolia, the important city of Thessaloniki was captured from the Venetians in 1387. The Ottoman victory at Kosovo in 1389 effectively marked the end of Serbian power in the region, the Battle of Nicopolis in 1396, widely regarded as the last large-scale crusade of the Middle Ages, failed to stop the advance of the victorious Ottoman Turks. With the extension of Turkish dominion into the Balkans, the strategic conquest of Constantinople became a crucial objective, the Empire controlled nearly all former Byzantine lands surrounding the city, but the Byzantines were temporarily relieved when Timur invaded Anatolia in the Battle of Ankara in 1402. He took Sultan Bayezid I as a prisoner, the capture of Bayezid I threw the Turks into disorder. The History of Scotland is known to have begun by the end of the last glacial period, roughly 10,000 years ago. Prehistoric Scotland entered the Neolithic Era about 4000 BC, the Bronze Age about 2000 BC, and the Iron Age around 700 BC. Scotlands recorded history began with the arrival of the Roman Empire in the 1st century, North of this was Caledonia, whose people were known in Latin as Picti, the painted ones. Constant risings forced Romes legions back, Hadrians Wall attempted to seal off the Roman south, the latter was swiftly abandoned and the former overrun, most spectacularly during the Great Conspiracy of the 360s. As Rome finally withdrew from Britain, Gaelic raiders called the Scoti began colonizing Western Scotland, according to 9th- and 10th-century sources, the Gaelic kingdom of Dál Riata was founded on the west coast of Scotland in the 6th century. In the following century, the Irish missionary Columba founded a monastery on Iona and introduced the previously pagan Scoti, towards the end of the 8th century, the Viking invasions began. Successive defeats by the Norse forced the Picts and Gaels to cease their hostility to each other and to unite in the 9th century. The Kingdom of Scotland was united under the descendants of Kenneth MacAlpin and his descendants, known to modern historians as the House of Alpin, fought among each other during frequent disputed successions. England, under Edward I, would take advantage of the succession in Scotland to launch a series of conquests into Scotland. The resulting Wars of Scottish Independence were fought in the late 13th and early 14th centuries as Scotland passed back, Scotlands ultimate victory in the Wars of Independence under David II confirmed Scotland as a fully independent and sovereign kingdom. 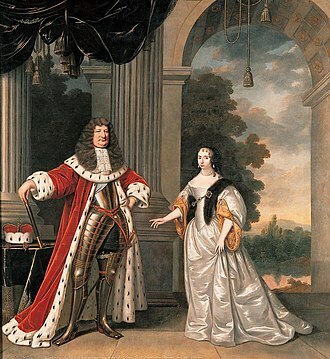 When David II died without issue, his nephew Robert II established the House of Stewart, ruling until 1714, Queen Anne was the last Stuart monarch. Since 1714, the succession of the British monarchs of the houses of Hanover and Saxe-Coburg and Gotha has been due to their descent from James VI, during the Scottish Enlightenment and Industrial Revolution, Scotland became one of the commercial and industrial powerhouses of Europe. 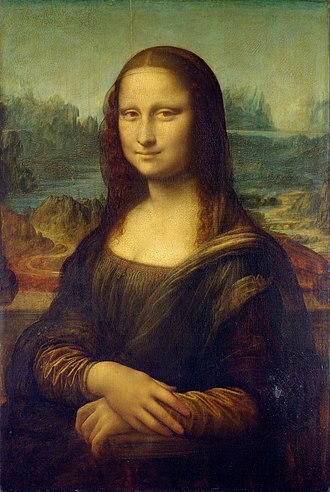 Mona Lisa, by Leonardo da Vinci, c. 1503–1506, one of the world's most well-known paintings. 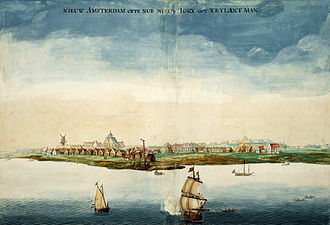 New Amsterdam as it appeared in 1664. Under British rule it became known as New York City. 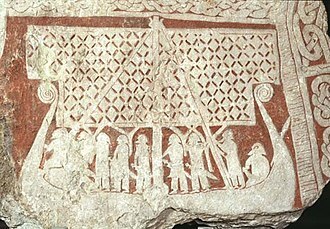 A picture stone from 800-1099 Tjängvide, Gotland. 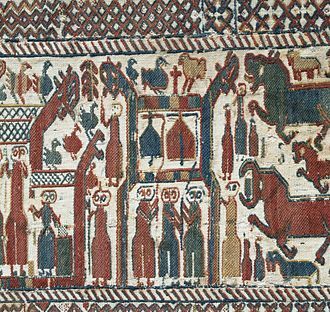 Skog tapestry, made most probably during the late 13th century. Image of King Carl IX on a wall of Stockholm Palace. Statue of Charles IX in Karlstad. Grand Prince Árpád crossing the Carpathians. A detail of the Arrival of the Hungarians, Árpád Feszty's and his assistants' vast (1800 m²) cycloramic canvas, painted to celebrate the 1000th anniversary of the Magyar conquest of Hungary, now displayed at the Ópusztaszer National Heritage Park in Hungary. 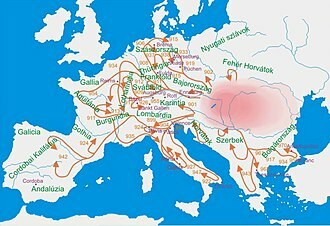 Hungarian raids across Europe in the 10th century. King Stephen I of Hungary, patron saint of Kings (from the Chronicon Hungariae Pictum). 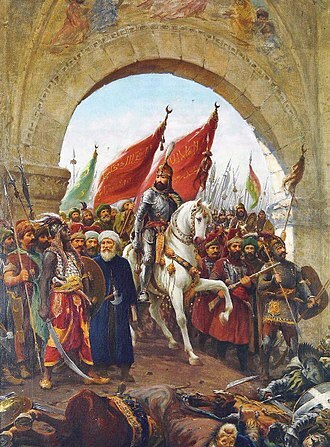 Mehmed II conquered Constantinople in 1453 and brought an end to the Byzantine Empire. 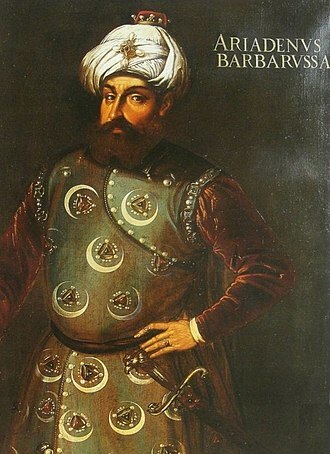 Barbarossa Hayreddin Pasha defeated the Holy League at the Battle of Preveza in 1538. Bond of the Papal States, issued 9 December 1818. The Breach of Porta Pia, on the right, in 1870. Papal Zouaves pose in 1869. Prussian Homage, Jan Matejko. After admitting the dependence of Prussia to the Polish crown, Albert of Prussia receives Ducal Prussia as a fief from King Sigismund I the Old of Poland in 1525. The oldest standing house in Northern Europe is at Knap of Howar, dating from 3500 BC. King Alexander III of Scotland on the left with Llywelyn, Prince of Wales on the right as guests to King Edward I of England at the sitting of an English parliament. Numancia, a painting by Alejo Vera. The Numantians kill themselves rather than surrender to Rome. 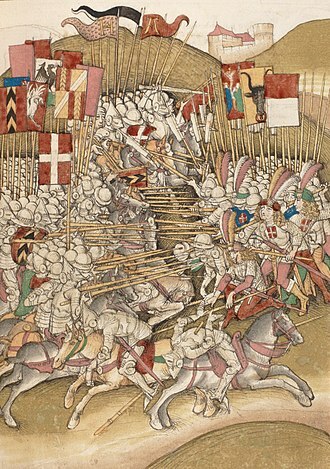 The Battle of Laupen (1339) between Swiss forces and an army of the Dukes of Savoy (Diebold Schilling the Elder, 1480s). Religious geography in 1800 (orange: Protestant, green: Catholic). Cross-section of the Irish Sea through Man, showing sea levels. 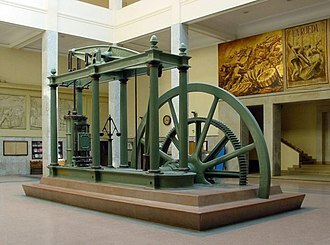 Development of the Watt steam engine in the late 18th century was an important element in the Industrial Revolution in Great Britain. 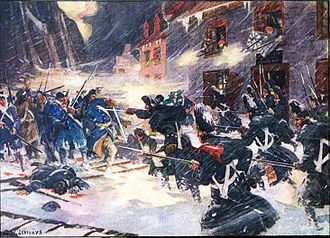 The American Revolutionary War took place in the late 18th century. The first document containing the word "Ostarrîchi", the word is marked with a red circle. The Venus of Willendorf, c. 25,000 BC. Naturhistorisches Museum, Vienna. Leather shoe from the Hallstatt culture, 800–400 B. C.
The Holy Roman Empire in the 10th century showing Bavarian marches, including Carinthia. La Pouquelaye de Faldouet was constructed on a site on the east coast looking across to the Cotentin Peninsula. Round towers were built along the coasts to protect the Island from French attack. The Death of Major Peirson, John Singleton Copley, 1782-1784. Plaque to the memory of Guernsey civilians killed, particularly in the 28 June 1940 bombing raid. Sample of coins from the Mercedes treasure displayed at a Spanish museum in 2015.